Are you in your best shape? Our ancestors were hunters and farmers, but we’re not. And because we no longer chase buffalo and climb trees for fruit, our lives have become too sedentary to be optimally healthy. In order to truly be in our best shape, we have to move more. But because of televisions, phones, computers, and cars, it’s not always easy to get up and get moving. In contemporary life, excellent health requires a system – it doesn’t just happen spontaneously on its own. It can be difficult – at first – to put a self-improvement system in place. Here are fifteen tips that can help you get into the very best shape of your life. You can prepare yourself for success. You just need to find the system that is uniquely right for you and implement it. You can implement these tips to help yourself look better and feel better in daily life. 95% of people do not understand how life gets better. Would you like to be among the 5% who understands? 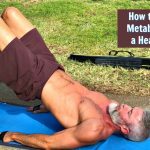 51-year-old Paul Talbot is an inspiring example of what fitness goals can be achieved after the age of fifty. When you have excellent health, anything is possible. It’s the foundation. When you build a house, you build the foundation first. Start there. When you truly understand that life improves as your health improves, only then do you begin the journey toward being in your best shape. The best year of your life probably hasn’t happened yet. Many imagine that the hardest part of being healthy is having to work out at the gym, or, having to eat healthy food all the time. the more consistently you exercise, the more accustomed you become to exercising until the actual act of exercising becomes rather exhilarating. the more you eat healthy the more accustomed you become to healthier foods until your taste buds evolve and you develop a taste for healthy food – and the taste of “standard” food becomes gradually less appealing. Though changing any habit can be more difficult in the beginning, eventually, the hardest part of being healthy is not the actual exercising or the actual eating of healthy food, because those do get easier with time. Unquestionably, the hardest part of being healthy is preparation: getting yourself organized while trying to anticipate how might get in your own way. People who take time to prepare are in their best shape. Super salads serve as an excellent example of the importance of preparation in helping you get your own body into better condition. Many über-healthy people have super salads for dinner several times a week. Super salads are not the blah side dish of days yore – no iceberg lettuce with a rubbery wedge of tomato drowning in oil-and-vinegar. Super salads are a meal unto themselves – big, satisfying, loaded with protein, fun to eat, and topped with crunchies. Once you get used to a healthier diet, eating a super salad is a highly enjoyable part of your day that you will actually look forward to. The hard part is making the salad, not eating it. The challenging part is washing and drying the vegetables. The dicing and chopping. The shopping for the ingredients. That’s the hard part – eating it is a breeze. If you wait until the end of the day, when you’re tired and hungry, to decide that you want a super salad yet you haven’t done any preparation or organizing for it, the chances of making a poor food choice is pretty high. when will you find time to do this shopping – and cleaning, drying and chopping? should you do it all one day a week, on your Saturday off from work? should you do it each morning before starting work, when you still have the bulk of your energy? should you pack your workout wear and gym shoes the night before? can you enlist the cooperation of your family or roommates to leave the living room free so that you can do your exercise DVD that evening, undisturbed? did you double-check your gym’s class schedule online to see if there were any changes? did you email your walking partner to confirm tomorrow’s session? There are few feelings more sublime than that satisfied, spent sensation one feels in their body after a particularly intense and effective workout. It’s the sensation of knowing you pushed yourself just hard enough – not to the point of injury or sickness, but hard enough so that you’re certain it will create unquestionably positive results and help you move toward your best shape yet. Remember, when you are in your tip-top condition, there is a powerful physical feeling that goes along with it. Our lives are, in fact, quotidian. Most of life is built on our everyday little habits. Replace daily little bad habits with daily little good habits, and eventually, over time, you will win at life. I’ll use anything for inspiration – sometimes you need to seek motivation to get that extra oomph for an intense workout. The best workouts have real motivation behind them. I’m not talking about the kind of motivation that comes from a pre-workout coffee or from watching your favorite TV show while walking on the treadmill. I’m talking about the kind of motivation that helps you become tenacious, passionate, focused and in-the-moment, so you can make the very most of that day’s workout. Regarding accountability, it can be helpful to have a workout buddy or even a fitness coach, sometimes. An accountability partner is someone who helps to shake things up, breathe new life into your workouts, make things more fun, more challenging and – most importantly – someone with whom to share your goals out loud. Inspiration and accountability will help you get into your best shape. Your missing ingredient is inspiration. You’ll need consistent inspiration to move your health up to the next level and keep it there. What you think, feel, and believe makes a difference in your health. I strongly encourage you to be careful what you watch on television, who you speak to, and what you speak about. Your brain is nothing short of miraculous, it will manifest more of what you’re already focused on. Also, it matters who you hang out with. If you are serious about getting healthier, then you need to surround yourself with as many fit, positive people around your age as you can. 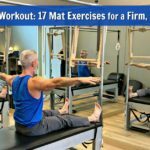 Visualization is helpful to athletes and health enthusiasts of any age, but it is even more helpful for people over the age of 50. 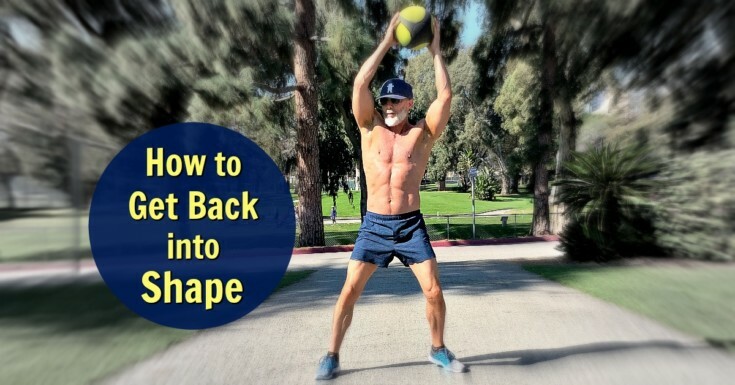 At age 53, David Gooding is a motivating example of how to use strength and conditioning techniques to improve overall health. Back when I turned 40 (almost a decade ago) and went online to try to find out about the physiological changes that happen to men as they age, and how best to deal with those changes, I couldn’t find the information I needed. I couldn’t even find many images of fit men over 40. All the fitness magazines had images of guys in their 20s and 30s, but very few images of men in their 50s, 60s, and beyond. To remedy this lack of positive imagery in media, I recommend positive visualization techniques. I encourage you to give yourself a few moments alone in a quiet room, to sit calmly, to breathe slowly and deeply, and visualize yourself as the person you most want to become. if you’re at 8 or above, you’re ready. if you’re 7 or below, come back another time – it’s not important enough to you yet. Next, imagine how you might get in your own way. What circumstances will prevent you from becoming that future, healthier person you see in your mind’s eye? These are your potential obstacles. Imagine what you will do when you encounter these obstacles. How will you sidestep them? Like many people these days, I use digital calendaring to track my appointments. However, when you need to take a fresh look at your typical week, it can be helpful to create a separate calendar of standing appointments to help make objective decisions about your overall time management. You can use the concept of the template to craft an ideal weekly schedule for your life that makes the most of your time and infuses your typical week with more health protocols. The best way to do this is to start with a blank slate – this is more of a mental breakthrough than anything else. You can keep the basic rhythms of your week intact (you don’t have to quit your job or relocate to a new city) but it’s just easier to start from zero with a blank calendar and then, from there, to block-out pieces of time for key activities. Action Step: print out a blank calendar week. You can use Google calendar, or simply use the calendar that came with your computer. If time management is a serious problem for you at this point in your life – and by “serious,” I mean that you feel stressed out and overwhelmed by all you have to do each week, then you might enjoy Laura Vanderkam’s excellent book You Have More Time Than You Think. Just set aside that one piece of paper – a blank calendar week. You’ll l use it periodically throughout the next few weeks. It’s a simple tool that will help you achieve big results. This blank calendar-week will be used eventually to create your Ideal Week. You can prepare psychologically for change (this is the most important step on this list). Which of these three lifestyle habits is most important: good nutrition, regular exercise, or low-stress living? It’s a question I enjoy asking when I interview health experts and medical doctors because it’s fascinating to hear their opinions. I have known individuals who eat healthily, but who do not exercise regularly, and then experience a significant health challenge. I have known individuals who exercise regularly, but who do not eat well consistently, and then experience a significant wellness setback. I have known individuals who exercise regularly and eat well consistently, but whose daily lives are stressful, and then experience a significant health challenge. The people I have known, however, who do all three, enjoy nearly perfect health and live joyfully. Author Dane Findley approaching his 50th birthday. In fact, I’ve never personally known a person who did all three and then experienced a significant health challenge (of course, it does happen; there are always exceptions and sometimes events occur – or our past habits catch up to us, no matter how well we might be living in the present). Though all three are essential, stress-free living is the most underestimated. Everyone already knows that it’s important to eat right and exercise often, but what many people still don’t fully realize is that chronic, low-level stress can erode health. All the relentless daily distractions and noise of modern life can take their toll. In fact, I recently had a medical doctor who specializes in healthy aging tell me that stress and aging are the same things, and that those two words can be used interchangeably. Stress is a culprit. Every day, with every step and every breath, we are assaulted by a multitude of germs, viruses, bacteria and parasites. With stress-free living, however, our own immune systems can usually handle all of that brilliantly. Outside Magazine reported how genetics may not play as significant a role in our shape and longevity as previously thought. Newer research indicates that it’s our lifestyle choices and daily habits that determine how long we live and the quality of our years after age 50. Good nutrition, regular exercise, and low-stress daily living, together, form the full circle of wellness and serve as an excellent paradigm through which we can look at our lives to determine where to make improvements. Today, I invite you to consider the moments of your daily life as they pertain to either nutrition, exercise, or low-stress lifestyle. As you go about your day, begin to recognize where each of your daily habits falls on the full circle of wellness. Also, try to determine when it’s you who gets in your own way, or when your environment seems to be making good self-care especially difficult. Of course, as you do this, I recommend not doing it in a blaming-and-shaming way, but with a light heart, a good-natured curiosity, and a sense of humor! In seeing your typical day in this way, it will become very helpful to you down the road as you begin to tune-up your daily life and make holistic improvements. People who are physically active for 30 or more hours a week – such as professional athletes or construction workers – need to fuel their bodies to match the intensity of their typical day. But for most of us, our lifestyles are much more sedentary than our ancestors’ lifestyles. Therefore, many of us require fewer calories. Resisting the temptation to consume more calories than you burn in a typical day is key to getting into your best shape. If you’re eating the standard number of calories a day for someone in a first-world country, you can experiment with lessening your calories by 200 from your daily average diet and see how it makes your body feel (200 is not that much; you’ll notice it, but it won’t be painful). There is also mounting evidence that low-calorie intake extends lifespan. Digesting food is a significant effort for the human body. I’ve always wondered if giving the body a rest from digesting frees-up its energies to work on healing in other parts of the body. My hunch is that the less healthy food we eat – much of the food found currently in the standard modern diet – the more effort it requires of our bodies. Science has proven that running reduces the mutations in our body’s mitochondria. However, it doesn’t take a lot of running to get into your best shape. We’ve always known that exercise is good for you, but new research reveals that working out consistently helps the human body to better heal and replicate its own cells. This means exercise (not nutrition alone) must be a part of our getting into the best shape of our lives. Alternate the types of exercise that you do and you’ll be more likely to workout daily – with improved overall results and less chance of injury. Alternate the types of exercise that you do and you’ll be more likely to workout daily – with improved results to your shape and less chance of injury. So it seems that running can have a significant impact on the way we age. But running isn’t for everyone. And even if running would be a good choice for you, you might have to build up to it gradually. No matter what the modality, you can exercise daily to the point where you burn at least 300 calories from each day’s workout. Your body can easily become fatigued and asymmetrical, often without you even realizing it. Ample energy and symmetry are keys to getting into your best shape. For example, even when working on your computer for a mere ten minutes (a seemingly innocuous activity) it begins to over-stretch your posterior deltoids while shortening the muscles in your arms and chest – and, over time, that modern-day “slump” we see in many people’s posture is created. The human body, however, is brilliant and has a built-in solution for nearly every challenge. Perhaps the most underestimated, overlooked, and simple solution is: walking. Walking is a way for the body to achieve homeostasis – to return balance to the mind and body (in fact, walking is a way to restore the spirit in many traditions). There’s something multi-dimensionally therapeutic that happens to us on a long walk. In some essential and primal way, it allows the body to reorganize itself. Walking is also easier on the joints compared to other exercises. Some experts believe walking has an uncanny ability to balance the body’s metabolism and other key functional systems. Action Step: I invite you to rediscover what walking can do for you. At some point today, go outdoors for a walk. If the weather is unpleasant, consider a shorter walk around the block. What’s most important here is to check-in with how you feel before the walk, and then, check-in again after the walk. Did the essence of your body, mind, spirit, and energy feel better before the walk, or better afterward? There is a calmness of mind that often occurs after age 50. You can leverage that into becoming your best shape, if you choose to. If you do each of the tips listed above, it is entirely possible that at the end of a year you could have lost 52 pounds of body fat. And – depending on what kind of exercise you did each day – your muscle tone, complexion, and posture will have greatly improved. It’s challenging to create one weight loss formula that applies to everybody because there are just so many variables. For instance, I’ve found over decades in my work as a professional fitness coach that the healthier someone is, the better their metabolism works and the easier they lose fat. So, it’s not just about counting calories; it’s also about listening to what your body needs – holistically – in order to be healthier. Life after age 50 can be fantastic! Ask your medical doctor what he or she believes will help you get into your best shape yet. You can be healthier than you are at this moment. The solutions are within your reach if you know how to position yourself for success. Action Step: as you go about the rest of your day today, I invite you to notice the key role that preparation plays in your life and the greater role that it could play in your life moving forward as you get into your best shape. Look for moments in your day when better preparation could have made a positive difference and produced a more desirable outcome. Increasing your awareness in this way will come in handy later when you begin to experiment with new ways of preparing for healthier weekly habits and improving your shape and conditioning. Today is a good day to get excited about your life. Health protocols help make you better from the inside-out. The more health protocols you engage in, the stronger you become – and the more younger-feeling and younger-looking you become. One year from today, will you be in your best shape? You can make the second half of your lifespan even better than the first half, but re-establishing your fitness after the age of 50 presents certain challenges. Here are 15 steps that can help you feel better and look better than you ever have previously in your adult life. Understand that life improves as your health gets better. Cultivate a mindset for preparation. Develop a joy for super salads. Do a different form of exercise each day. Realize that your health improves by stacking good habits. Expose yourself to daily inspiration and accountability. Appreciate that your brain needs a dependable gatekeeper. Pysch-up your mind for beneficial changes. Live within the full circle of wellness. Shave 200 calories from your average day. Burn 300 extra calories a day by moving your body. Walk yourself into your best shape. Boost your metabolism with health interventions. Health protocols help make you better from the inside-out. The more health protocols you engage in, the stronger you become. Who do you know who might find this article helpful or inspiring?